We're unpacked and back to our normal schedules, which means it's just about time to recap the races! This year, the adults were in for the half (only...) and it was right in the middle of our trip. We already had 3 full days of parks, food, and late nights leading up to the morning, so needless to say, we weren't giving the race our best. 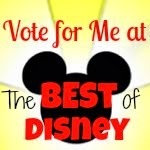 With that, I had a blast and it was a great reminder of why I love to run Disney! My mom stayed with the boys while Bill and I were up early to run (thanks mom!). Disney World races never disappoint with those early wake up calls! We were out of our hotel around 3:45, which is pretty good since we were aiming for 3:30. We met up with Chris and found out that Kate's kidney stones (which clearly did not get the memo that we were on a Disney vacation) had kept her up sick all night. She decided it would be best to sit this one out and come back next year for the full, but that's another post, another day, and a fun prospect for next year! We boarded the buses as usual. I personally prefer to let Disney do the driving on vacation. I know many will disagree and say take your own car, but I should never be trusted driving at 3 am in a sparkly skirt and ears! We had our hands full with breakfast, bags, watches, headphones--I always look like a hot mess getting on the bus. It was business as usual, minus the bag tags. This, friends, is why you should read your event guide. I freaked out because I was missing my tag, just to find out they label it for you when you get there. Corrals were well organized and we did the long trek, hit a few port-o-potties, and got a little time to rest before we began. I was in corral E, but we got off surprisingly fast. I was in the second wave of this corral. I have to say, I appreciate the waves instead of corrals lined up to P. It's a nice incentive for people to get there early! The course felt so comfortably familiar! It seriously felt like a homecoming! I was sad to have missed the Cigna meetup the day before (we were doing lots of family stuff and I couldn't bail on them), but it was great to just know I was surrounded by friends. 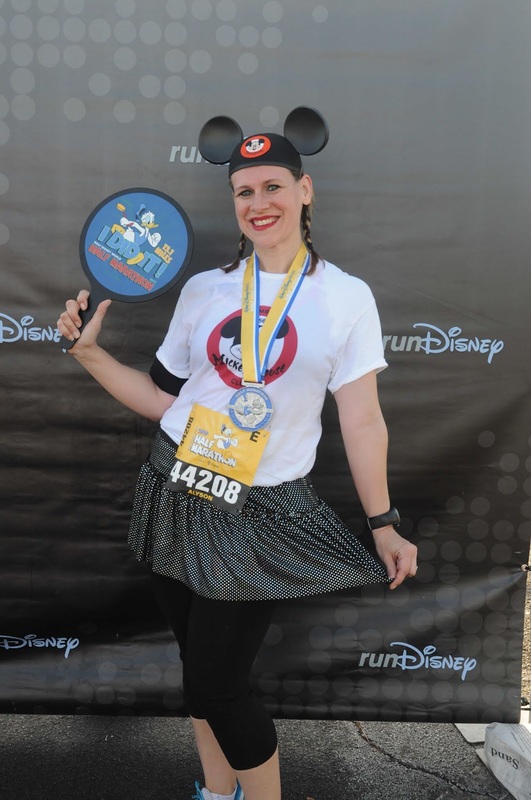 If you've never run the half at WDW, here's the quick summary: lots of back roads, a little Magic Kingdom, the CASTLE, more back roads, lots of cones, a touch of Epcot (really just a touch), and the finish line. I was lucky to enter MK in the dark and got to see the castle all lit up for the holidays. It is so beautiful, and running up Main Street to the castle may be my favorite part of every runDisney race. The WDW races never have much time in the parks, but in some ways the wide open spaces are nice. There's a few crowding points (hello cone alley!) but overall there's space to breathe and move. 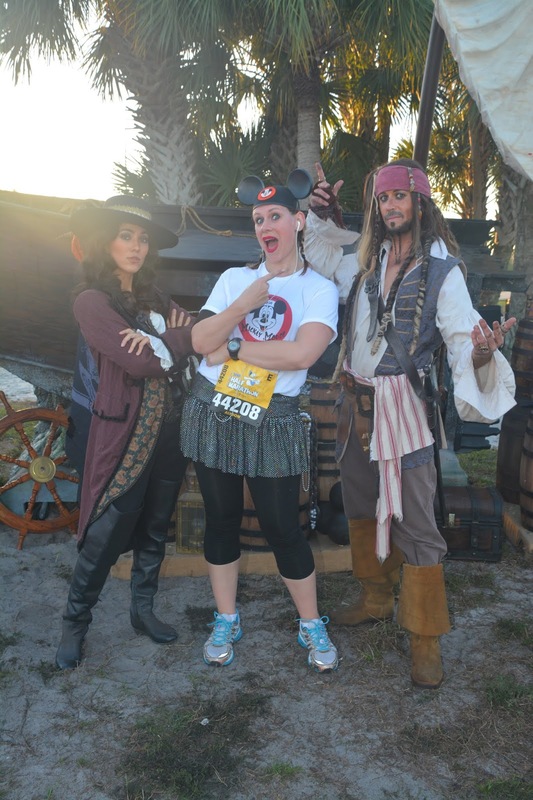 I didn't do many photo stops in this race, but I had to stop for Jack Sparrow. My first big disappointment as a mother--here I was so excited to show my pirate obsessed kid, and nope. Not impressed at all! Of course Daddy got a picture with Lightning McQueen and that was a huge hit! Robby hasn't even seen Cars, nor does he really care much about cars in general. Go figure! I finished in a respectable, but definitely not goal-reaching or "good" by my standards 2:33:33. Far from a PR and far from where I wanted to be in this race (my initial goal was 2:15), but it felt good, I wasn't in pain or pushing so hard I thought I'd die, and I finished in time to get back to the hotel and help my boys get ready for their big races. Post race was very well organized: medal, snacks, pictures, bag pickup. Pro tip: pack a lightweight, small backpack in your gear check bag! Those bags are so big and cumbersome. It was really nice to be able to stick all my junk in an actual backpack. I saved the ones we got a Princess and Tink. They are perfect! 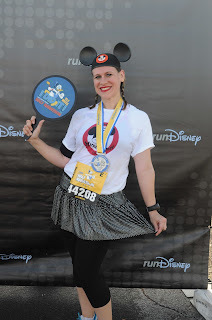 I wish runDisney did those for every race! I got back to the hotel with plenty of time for breakfast, waking the kids, getting them ready for their races, and taking the bus to ESPN. I wish I had a bit more time for a shower, but luckily it wasn't too hot for the race. I do hope to be back next year for the marathon with Kate. We are planning on it, but also seeing how training is going for both of us as the race day approaches. Little kids definitely make this whole thing a lot more difficult! Did you run marathon weekend? What race or races did you do? How did you do? Any PRs out there?